Are you in the Washington, DC area and looking for a fun place to take the whole family? Are you looking for an inexpensive activity idea? Would you like to learn more about aquatic animals? Well, you should check out the National Aquarium in Washington, DC. The National Aquarium in Washington, DC is hidden away in a government building and you might just miss it if you walk by too fast. 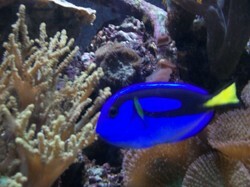 Even if it is a little smaller than some aquariums, it has many exhibits, animals, and a gift shop. Did I mention it is also much cheaper than most aquariums? You should check it out. I enjoy going to aquariums just as much as the next person, but sometimes it is really expensive. It is not that unusual to pay anything from $20 to $30 per person for one aquarium visit; that may or may not include extras like dolphin shows. If you are going as a group, that can really add up. If you visit the National Aquarium in Washington, DC, you do not have to worry about high prices. The price for an adult ticket is $9.95 and a child’s ticket is $4.95. Sure, it may not have as many animals as some aquariums, but who needs to see dolphins or penguins when you can save money like this? One of my biggest gripes about aquariums are the crowds of people. Sometimes you are just trying to see the octopus, but all you can see is the back of 5 people’s heads in front of you. At the Aquarium in DC, not only can you get right up to the tank, you can practically have a conversation with the octopus… if an octopus could talk. Since not that many people know this aquarium even exists, there are no huge crowds in your way. I went on a Saturday and there was barely a line to buy tickets. Try doing that at the National Aquarium in Baltimore, MD on a Saturday! You will be waiting in line for what seems like forever. Sure, there were visitors at the aquarium that day, but it was not too many people. The whole area felt really comfortable and you could genuinely look at all the aquatic animals. There was even time to read all about them and take photos. None of my photos included the back of someone’s head or a random hand. It is pretty nice. Let’s talk about the animals you can visit at the National Aquarium in Washington, DC. As I previously stated, you are not going to find the variety you might see at larger aquariums. No, you might not see puffins, or boa constrictors, or whatever, but you will see lots of fish, turtles, toads, sharks, alligators, an octopus, and snakes. 4. You Can Spin the "Wheel of Doom"
Have you ever wondered all the ways sea animals could die or get mutilated? OK, honestly I had not thought about it until that day, but hey, this aquarium covered this “interesting” subject matter. You can spin the “Wheel of Doom” to see how you would get injured or die if you happened to be a critter in the water. What fun! It is a little weird, but kind of funny. What I found most interesting about the National Aquarium in Washington, DC is it is easy to pass by and not even realize it exists. It is the oldest aquarium in the nation, but probably one of the least popular. I rarely see any advertisements for it and I’ve lived in the DC area for most of my life. The aquarium is located in the lowest level of a government building. If you blink while walking by it on the street, you could easily miss the entrance. Once you do go into the building, there are security guards and a metal detector to walk through. Sure, that may seem a little extreme, but it is the national government building. Considering how weird things have gotten, I don’t mind feeling a little safer when I walk into a building with a lot of random strangers. It makes me sad to think these precautions are needed, but it is DC and so I understand the situation. Of course, as long as the alligator doesn’t escape, I feel pretty good about my safety anyway. I am sad to say I just learned the National Aquarium in Washington DC will be closing in September 2013. The building needs repairs and they have not yet found a suitable location to a new aquarium. At this time, it appears the aquarium is closing for good. The animals will be moved to new homes at the National Aquarium in Baltimore or other aquariums in the region. If you would like to visit the National Aquarium in Washington, DC, now is the time to do it. Say good bye to all the little critters before they go on a journey. Check Out More Fun Articles! Buy Some Fishy Zazzle Products! After twenty years of caring for goldfish, I've just been so startled by an algae eating fish tank cleaner, that I'm rushing to Wizzley to rave about it. How to keep Coolie Loaches in your tropical fish tank. Learn how to care for these very cute tropical fish.